Winning conference games has been tough for Fordham under Pecora. In his first three seasons as head coach, the Rams went a combined 7-41 in A-10 games. 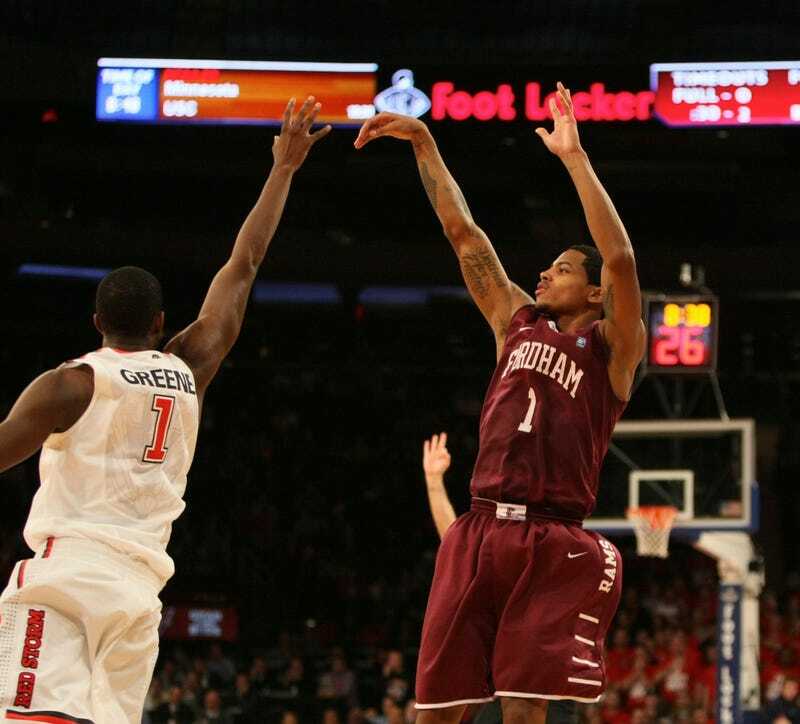 So Fordham's 0-4 start to A-10 play in 2014 shouldn't come as a surprise. But a matchup at home against conference newcomer George Mason seemed like an opportunity for the Rams to break their streak. Fordham stumbled out of the gate, falling behind 16-7 in the game's first eight minutes. Pecora, upset with his team's effort, decided to swap out all five players on the floor, replacing starters with reserves, including seldom-used former walk-on Khalid Robinson. "It was the lack of effort," Pecora said after the game. "I just said, 'Enough. I've seen enough.' I heard some guy behind me scream, 'What are you, crazy?' If you put them in and [the other team goes] on a 10-0 run, the game's over. But I thought they competed and I knew they would play hard." It was a risky move, but it paid off. "I ran those five in there just to shake things up a little bit, and they did," Pecora said said. "When that first group came back in, they played with greater intensity, so that was good." Star freshman Jon Severe led the charge for Fordham and finished the first half with 16 of Fordham's 30 points, as the Rams trailed by only one, 31-30, at the break. But Fordham was sluggish again to start the second half. Five minutes into the half the Patriots had already extended their lead to 10. With the defense locking down on Severe, Fordham turned to senior captain Branden Frazier to jumpstart the offense. After being held scoreless in the first half, he scored 22 of Fordham's 46 second half points. "I think in the first half I was just a little too anxious to score," Frazier said. "I think I was rushing it a little bit too much in the first half. Then in the second half, during the break I just sort of calmed down. I knew that I was going to get shots in the offense, and it came to me. I started knocking them down and gaining more confidence." It was Frazier who found Bryan Smith waiting in the corner for a three that gave Fordham the lead with 8:32 left on the clock. George Mason made things interesting, though. A three from Patrick Holloway cut the Fordham lead to two, 70-68, with 38 seconds left, but his attempt to tie it 13 seconds later went begging. The Patriots still had life, trailing 72-68 with 19 seconds remaining, but Severe came up with a timely steal, was fouled, and headed to the line for two shots. Severe's free throws put the game away and Fordham wrapped up a 76-70 victory. George Mason head coach Paul Hewitt was frustrated that his team's elusive first conference had slipped away once again. "We had chances to score and didn't cash in," he said bluntly. "They had chances to score and they did." "I thought it was a gutsy win," Pecora said. A win, yes, but a win over an A-10 bottom-feeder. Pecora knows there is a long way to go before his team is a contender in the A-10. "It's a grind, but that's what it's like in any good conference, and this conference is better than it's ever been, in my opinion," said. "I mean, you have nine teams in the top hundred [nationally] in this league. I don't know if we've ever had that in the three years that I've been here. It makes this whole process that much more difficult." "We've got 11 games left in the league and then the tournament. We just have to get a little bit better each year," he added before realizing his Freudian slip, "or each day, rather."